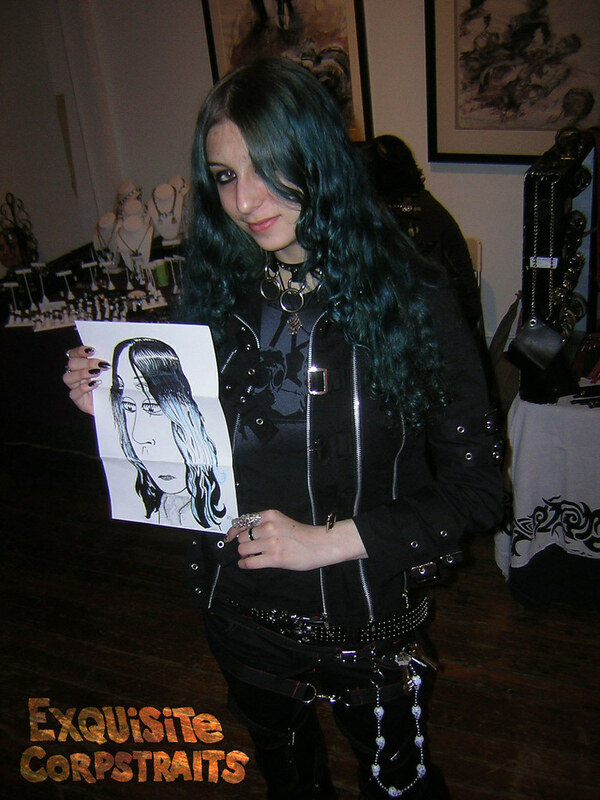 Last weekend I had a table at Pandoras Trunk, where I sold some of my clothing designs and comics. 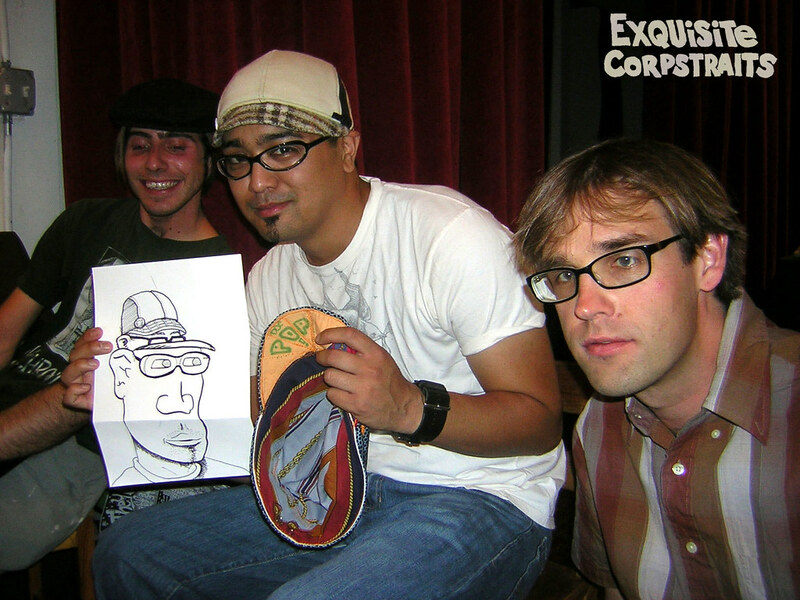 As an extra bonus, Mike, Rio, and myself set up a chair and tried a new creative excercise based on the cadavre exquis. The equisite corpse is a drawing (or writing) excercise in which a piece of paper is usually folded into thirds. Each artist works on a section of the folded paper then continues their lines just a little bit onto the next section of paper before folding their section up (so the next artist can’t see any of it) and then passing it on. After all three sections are finished, the paper is unfolded and the overall image is seen for the first time. That’s pretty much what we are doing, but we have turned it into a way to do caricatures. At Pandora’s Trunk we set up some chairs and did Exquisite Caricatures for only $6 each. It was tons of fun and everyone seemed to love the results. It’s one of the few creative methods where both the artist and the model are surprised to see the final results. We had been talking about doing this for many months now, so I’m glad we finally tried it out. After I get back from Minneapolis, I think we’ll set up on 20th and Valencia and do this for a couple of hours. The cool thing is that if we time it right, we can work on up to 3 subjects at the same time. Click here for the full flickr set. On a similar topic, I had previously blogged about a similar project that needs 4 artists. The paper is still folded in three parts, but each section is done in pencil only. After three artists have completed their sections, the paper is unfolded and the fourth artist inks the entire piece. This gives the piece a more consistent look, while still getting that surreal style. 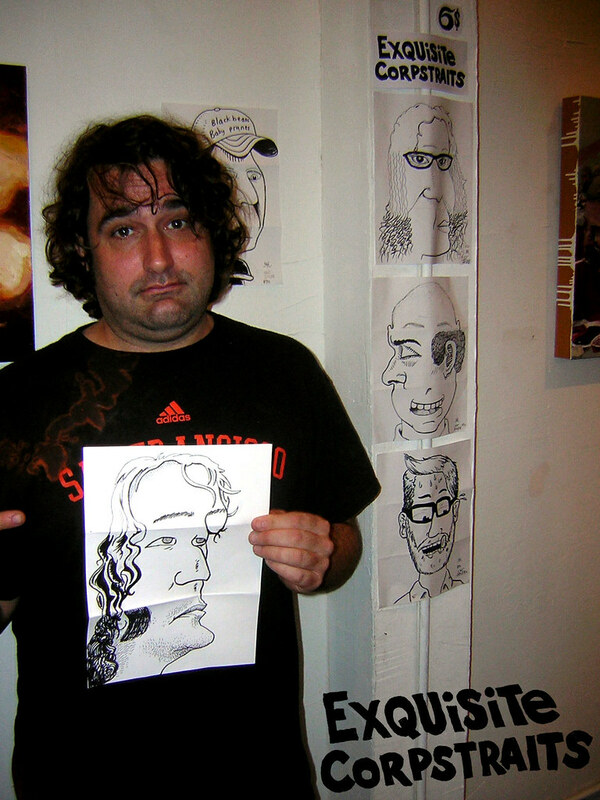 It’s excellent exercise too as I feel a large part of our group could use more practice inking other peoples pencils. When doing this exercise, we usually have four sheets of paper and work in 10 minute cycles, after each cycle we pass the folded paper to the artist on the left. After the pencils are done, the inker works for about 30 minutes. Ideally, you’ll have four finished pieces with four different artists, and nobody will have worked on the same piece more than once.